Pentax's latest Optio features a 3x optical zoom, 8 megapixels, a "high sensitivity" scene mode (ISO 800), and a spacious 2.5-inch screen. Other features include a CCD-shift image stabilization system, in-camera effects and frames, and the ability to record movies in MPEG-4 DivX format. If you want to find out more about this handsome, capable shooter, check out the full review on dereview.com. 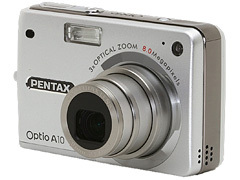 I am using a Pentax Optio A10 and I have got a problem with the camera. I have cleared all the photos of the camera and everytime when I want to put my new photos on the computer I get some old fotos over and over again. They are not showing on the camera only on the memory when I put them over on the computer. Please tell me how I can clear those fotos of the memory. You would be of great help. My Pentax Optio A10 will not boot up and stay on. I have checked the battery and it appears to be working properly. When I turn the camera on, the Optio screen comes up for a brief moment, the screen turns grayish and then the screen goes black. I am not an afficianado, but this is a great camera for me. Any suggestions will be greatly appreciated.